Spratt Transport Services (a Division of Spratt Logistics Ltd) is a leading bonded warehousing and transport company based in Santry, County Dublin and, last summer, after several months of work, the IIFA Full Trading member was granted Certified Haulier status by the Irish Aviation Authority (IAA). This was a significant achievement for this independent Irish airfreight transport provider. Freight agents based in Dublin, and indeed across Ireland, utilise Spratt Transport Services for their transport requirements to and from Dublin Airport as all drivers, office and warehouse staff are airfreight security trained to handle known cargo. The progressive family-run operation is run by two brothers - Pady Spratt Jnr (26 years old) and Sam Spratt (23 years old) and was only the second company in Ireland to be awarded the brand new “Certified Haulier” status from the IAA. As a Certified Haulier, this enables Spratt Transport Services to transport not just known cargo but also warehouse known cargo. The freight forwarder does not have to worry about breaks in the supply chain for known cargo. When cargo is “known” it does not have to be x-rayed and thus, the supplier and freight forwarder can save on x-ray fees. Company Director Pady Spratt Jnr explained: “More and more suppliers and therefore freight forwarders are becoming “Known Shippers” and with our Certified Haulier status, we will be able to look after their known cargo transport and warehouse requirements from our Santry, Dublin 9 depot. “Our trucks go to Dublin Airport every morning, afternoon and evening to all the different handling agents such as WFS, Emirates, Swissport, Aer Lingus and DHL. Back in the early 1990s, the late Paddy Spratt Snr sowed the seeds for the development of one of Ireland premier bonded warehousing and transport providers. Paddy’s untimely passing in October, 2014 left a big void to fill but his sons, Pady Jnr and Sam, are proudly building on his legacy. In 2016, Pady Jnr was invited to speak at the prestigious FIATA conference which was held in Ireland for the first time in 35 years. 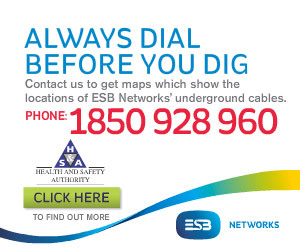 “It was a big achievement for an Irish-owned family company. The company gained a lot of exposure in front of a worldwide audience and we have picked up quite a bit of work as a result,” he added. Spratt Transport Services specialises in handling and stripping incoming inbound freight / cargo shipments from groupage LCL and FCL containers and trailers from all over the world such as England, Holland, Belgium, Germany, Austria, Portugal, Spain, Italy, China, India, USA and much more through their overseas partners on a daily basis. They hold, store and deliver for their customers as well as distribution throughout Ireland and Northern Ireland every day. For distribution, they collect and deliver next day to all 32 counties throughout the country and cover a full range of pallet distribution – air, sea and road freight every day. They will book in consignments with your clients here in Ireland and will store the freight until it is due to be delivered. For freight forwarding customers, Spratt Transport Services cover Dublin Airport every morning and evening for collections and deliveries for both import and export shipments due inbound and outbound around the world. They cover seafreight and roadfreight pallet distribution everyday – citywide same day, nationwide next day. For roadfreight, they are in a position to deconsolidate and devan incoming trailers and containers from the UK, Europe and worldwide to distribute around Ireland and Northern Ireland. In February 2009, Spratt Transport Services moved into the companies own bonded warehousing and distribution centre in Santry, Dublin 9 which is located just a few minutes from Dublin Airport, the Port Tunnel, M50 and Dublin Port so are ideally situated to suit both forwarders, transport partners and private companies/individuals. Ambitious plans in the pipeline to expand the business in the coming years. The list of Spratt Transport Services’ loyal customers includes ‘The Notorious’ Conor McGregor! “We provide a motor vehicle shipping service and personal effects shipping service. A typical example is that we transported Conor McGregor’s car home from Los Angeles.” Sam Spratt, Transport Manager, commented. 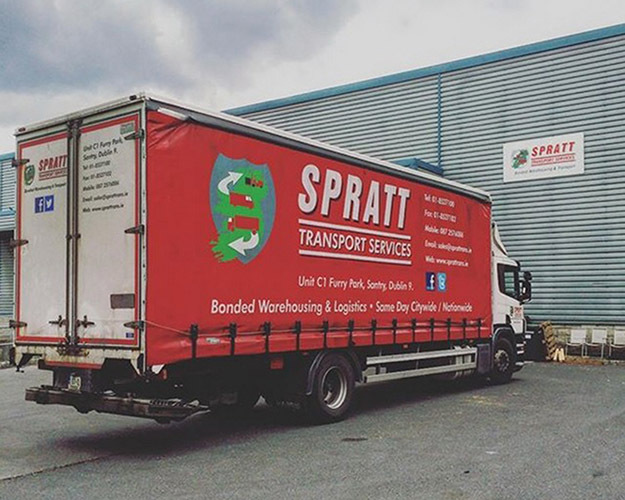 For your pallet distribution or warehousing freight management needs, contact Spratt Transport Services today on 01 8527100 or visit the quote section on their website for an email quotation. They offer a full ship service to all points of the globe and guarantee the best prices.